Delta Gamma took home the top prize. Editor's note: Sam Zacher is a Maroon editor. It was a joyous day of dodging, ducking, dipping, diving, and dodging at Henry Crown Field House this past Saturday, as hundreds of Greeks turned out in force to compete in Phi Delta Theta’s (Phi Delt) Annual Dodgeball Tournament to benefit the ALS Association in its fight against Lou Gehrig’s Disease. And there was no better way to do so than with America’s favorite middle-school pastime: dodgeball. This time, no one got picked last. Competition proved intense as teams of all letters strove to capture the coveted golden chalice trophy, “strove” here meaning whipping rubber balls at each other's faces. The young men of Phi Gamma Delta (FIJI) were particularly fierce competitors and the odds-on favorites to win it all. They all but assured me of their victory. “Have you seen the movie Dodgeball? We’re Team Cobra,” said one of the FIJIs (among the cacophony of dodgeballs hitting flesh and pained screams, it was impossible to tell exactly who). For the Dodgeball-illiterate: Team Cobra contains the movie’s bad guys, and the FIJIs seemed to relish this reputation as they dismantled one squad after another with their vicious volleys. Delta Gamma (DG) seemed to be the frontrunner in the women’s bracket, although not by its own admission. “I’d say the DGs and the AOIIs (Alpha Omicron Pi) are the favorites today,” said third-year Jennifer Hill, whose squad of first-year swimmers had just been eliminated after a hard-fought match against the unstoppable Delta offensive. She assured me that the swimmers were the more athletic team, but that their aquatic skills didn’t transfer well onto the hard surface of the dodgeball court, a textbook case of the Platypus effect. The season-ending loss proved devastating for the first-years, who clearly spent themselves in preparation for the tournament. “We’ve been playing the sport for approximately 30 minutes,” Hill said. Victory and heartbreak aside, Phi Delt Community Service Chairman and second-year Sam Zacher was keen to emphasize that the occasion was, at heart, about students getting together to have a good time, fostering Greek brotherhood and sisterhood, and doing good work for the ALS Association. Phi Delt had not, by Zacher’s own admission, raised a huge amount of money with the tournament, but every little bit helps, and the event was quite clearly a success in most other regards. “I mean, take a look around,” Zacher said, gesturing to the cavalcade of cheering, smiling students in gym shorts and sports bras. Zacher estimated the event’s participants were about 75 Greek-affiliated, but all participants were welcome and their contributions much appreciated. “They play for fun, they play for the trophy, but most importantly, they play to fight Lou Gehrig’s Disease,” Zacher said. They also came to eat complimentary snacks and drink Red Bull, courtesy of Phi Delt and the Red Bull Girls. Then came the moment we’d all been waiting for: the tournament championships. 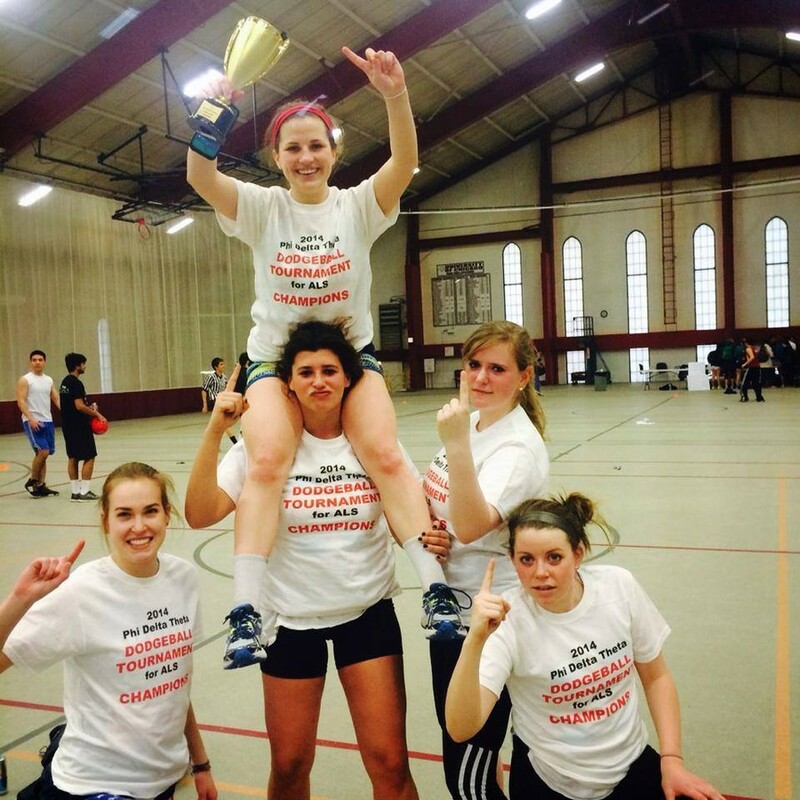 The DGs made short work of a porous swim team defense in the women’s final. The FIJI Islanders had a tougher time against the men’s swim team, where the excess mass that allowed the FIJIs to accelerate their balls to near-lethal speeds also made them easier targets for a wave of marine late in the match. Yet the swimmers were ultimately no match for the Greeks, who came back to win after a succession of deft deflections and catches. I caught up with the victorious FIJIS after the match, who proved themselves adequately humble champions. “I told you we were gonna win it, and we won it,” second-year Nick Pielech said. Always the canny sportsmen, those FIJIS. Still, they were eager to point out that they couldn’t take all the credit for the victory. “This win is really for Steve McGugan,” first-year Steve McGugan said. The squad then chugged Red Bull out of the solid gold trophy cup, proving that there truly is no greater glory that attends a man than that which he wins with racing feet and striving hands. The DGs attributed their victory to a strong squad of returners and a clutch performance by the group in the tournament’s last leg. “We really came together as a team toward the end; it was motivating to see that kind of teamwork,” second-year Caroline Bye said. “We played an incredible game, and the fact that it’s all for philanthropy makes it all worthwhile.” But the DG’s had little respite to enjoy their hard-earned win—Saturday was also the day of their winter formal. And when they donned their sequined dresses and applied their jubilant red lipstick later that night, they did so not merely as women of Delta Gamma, but as victors and as champions, unbowed, unbroken, undefeated. Duck and dodge, noble DGs. Duck and dodge.